Post-laminectomy syndrome is a condition where the patient suffers from persistent pain in the back following surgery to the back. This article reviews this condition in a bit more detail. A laminectomy is a procedure where a part of the vertebra that protects the spinal-cord is removed. It is usually performed to relieve pressure on the spinal-cord from a protruding disc. Very often, following a laminectomy, patients recover without any complications. However in a small group of people, back pain and sometimes leg pain may persist following laminectomy. This persistent pain is called post laminectomy syndrome. Post-laminectomy syndrome is also called Failed Back Surgery Syndrome, or FBSS. 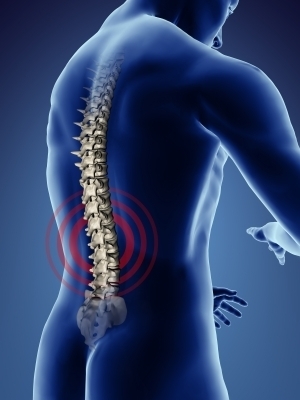 There are a number of reasons why patients can develop back pain following a laminectomy. These could include the fact that the surgery itself was probably not necessary or that the surgery did not have the outcome that was expected. In some cases, despite performing a laminectomy, patients experience pain because the spinal column itself is narrowed in a condition called spinal stenosis. Sometimes, there may be a small fragment of the disc still remaining following the laminectomy which can irritate the spinal-cord causing pain. In other words, the term "post laminectomy syndrome" encompasses any cause that results in back pain following back surgery. There is also evidence to suggest that patients who are smokers are more likely to develop post-laminectomy syndrome following surgery to the back. In addition to this, patients who have previously had a failed surgery in the back are at a higher risk of developing this syndrome. The most common symptom that patients experience is back pain at the site of surgery along with leg pain. As a result of the pain, patients have difficulty performing their activities of daily living and may have difficulty sleeping as well. The longer the pain lasts, the more of an impact it can have on the patient’s lives resulting in depression and anxiety. When examined, patients will still complain of tenderness at the site of surgery. Doctors may notice altered postures and varied positions when walking. In most cases, a history and clinical examination is sufficient to make a preliminary diagnosis. However, sometimes x-rays of the site of pain may reveal the cause for the pain. More advanced scan such as a CT scan or MRI will show whether there is residual compression on the spinal nerves following surgery. Any infections or abscess formation around the spinal cord may also be diagnosed this way though additional blood tests may be required. How is Post-laminectomy Syndrome treated? Treatment options may vary. Below are some of the options your doctor may consider. Pain killers:these may be the first-line treatment that is prescribed by the doctors. In cases of post-laminectomy syndrome, the doctors may prescribe morphine-based painkillers in high doses. However, if this is done, the patient will be monitored closely to avoid the development of dependence on opioids. Physical therapy:this may be recommended by the treating physician as physical therapists can prescribe exercises and treatments such as electrical stimulation which can help relieve pain and improve overall movement. Specialist therapies: in some cases, doctors may consider referring patients for more advanced treatments such as epidural nerve blocks, radiofrequency denervation and platelet rich plasma therapy. Research is always being conducted with newer techniques being looked into all the time.